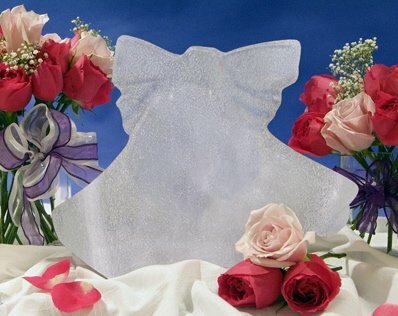 I have been to parties and weddings where the centerpiece of the food table was an ice sculpture. They can be a fun way to decorate. 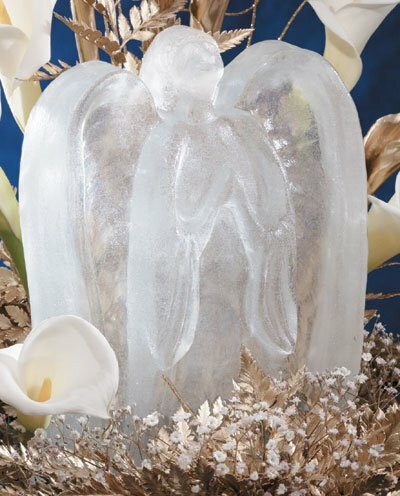 It used to be that you had to order a special service for these ice designs, but if you want one that is only 14 inches high and you have a chest freezer you can make your own. This doesn’t mean you have to become a sculptor! 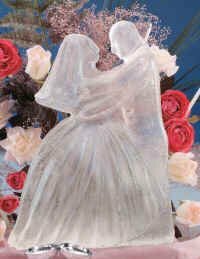 If you live in the cold climates like I do, then winter can be long and there is not a whole lot of decorating you can do outside, but what I thought would be cool would be to create a few of these ice sculptures, especially around Christmas and place them outside. You can get snowmen or pumpkins, angels and bells and more, I thought this would be fun and obviously would not melt right away. You could place twinkle lights around them, and even those can be purchased as battery operated so no plugs needed. What a fun way to add some décor around the holidays. Even Halloween would be fun. In Ontario it can be pretty cold on that night, but even if it is not freezing it is likely cooler outside than in the house so the sculpture should last while the trick or treaters are out and about. If you use these shapes on your dinner table, just make sure it sits on a bowl or surface that will take the slowly melting water. A bowl of crushed ice or hidden freezer packs will extend its life. You fill these with water and then put in your deep freeze. The backs of them are flat but the front has the 3D design. This would look great on your Halloween party table, but it could also look awesome outside. You could set these up on your front yard with twinkle lights behind them to illuminate the ice especially if you use orange lights. Just an idea! 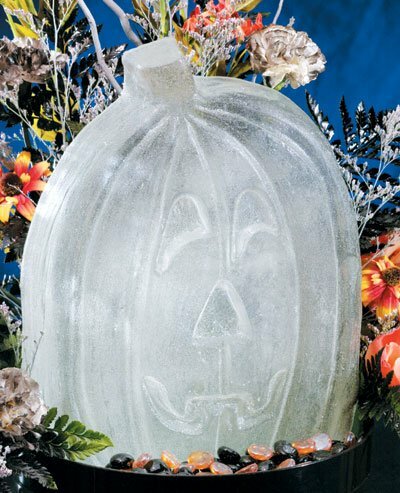 On an inside table you could sit this in a low bowl of ice but then decorate all around it with Halloween themes. Add orange food coloring to the water then add to the mold and get a vibrant orange pumpkin for your table. Sit it in a bowl of crushed orange ice or cubes or hidden freezer lunch packs to extend the life of your creation. You can make one of these and then on the day of your party sit it in a bowl of shaved ice, or ice cube shapes that people can grab for their drinks. If you live in a cold climate you could also make a few of these for outside and have your decorative lights setup behind it to shine through the ice. If it melts, make another one! You could add these to a plant pot on your front porch for some fun Christmas décor but this also works for the entire winter. Why not make the fact it is freezing cold outside work for you! You can make a few ahead of time if you have a chest freezer. Simply take out of mold and place in a bag and keep in the freezer. This can be such a fun idea. Along with the snowman you can add this angel. Add a few twinkle white lights behind this sculpture and it will look amazing. I think these would be a great addition to those front porch planters that you used in the summer. Sit the snowman or the angels on top and add some twinkle lights. Keep them on either side of your porch or walkway to add some pizzazz to your festive decorating. These can be kept going past Christmas too. This can be added to the Christmas theme or for a wedding table. If using on the food table, then place in a bowl of dry ice, or crushed ice and decorate around it. This will contain the sculpture as it melts. You can also add food coloring to the water to create a colorful bell. This is an affordable way to add some pizzazz and interest to the wedding table. You could use dry ice to add some ambiance or use crushed ice or molded ice cubes to add to the décor and decorate around it. Just something a little different that you can do yourself on the cheap. 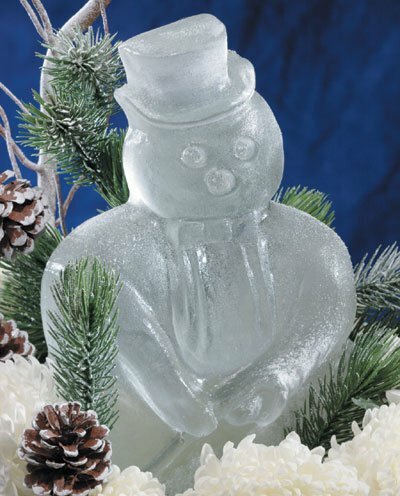 Many of these ice molds are available online. If you love the idea of using ice to sculpt or to decorate with for those cold winter nights, why not greet your guests with a warm welcome by using ice candles on your property. You can make these with large buckets to definitely make a statement or smaller ones that you can group together. Below is a video showing you how to make your own. Another really cool idea is to use a Bundt cake mold and make your very own ice wreath. You can dress it up with berries and greenery frozen right into the mold. This would decorate the celebration table nicely and you could also add food coloring for something different. I love how the red berries really come through and show in the ice. You don’t have to use the real thing you can go to the dollar store and use plastic greenery and berries, just freeze them into the wreath, check out the video below. You can get more intricate and detailed shapes online to use to decorate tables, and you can create your own molds for outside winter décor. Ice sculptures are fun and cheap to make, just the mold and water. Have fun!